Hope you all will have a fantastic Friday and weekend. Today I want to talk with you all about the last thing my friend Anna got me from Ireland. Honestly, I'm crying because I know they will end at some point and I won't be able to get new ones so soon. Then I will just read these posts again and cry haha. Back to the point. 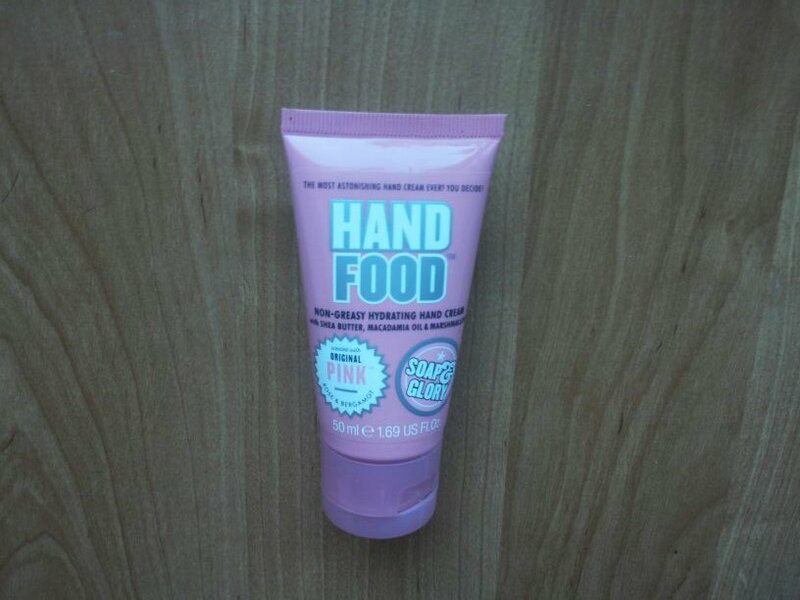 Today we will talk about Soap and Glory Hand food. I won't tell again some information about Soap and glory, but if you're interested you can find it here , where I talk about my first impression and also about their amazing body butter. I have this one in a travel size.The pros about travel size are that you can always carry it with you in your bag and it doesn't take much place. The cons are that then it will end faster and if you live in a country where you can't buy Soap and Glory it's pretty sad. I absolutely love Soap and Glory product packagings. They all have this cute pink colour while the graphics save it from appearing too twee and girly. On the very front of this says that non-greasy hydrating hand cream with shea butter, macadamia oil and marshmallows.....yes I know what you all are thinking! In winter, I have extremely dry hands and sometimes it also happens in summer, so I always have a lot of hand creams at home. What I don't like about other hand creams but love about this one is that it's not greasy and liquid. Massage gently and quickly absorbs into the skin. So it's not like you apply hand cream and then for like 10 minutes you can't do anything. For example, I applied this hand cream exactly before starting to write this post and keyboard keys are not remaining moisture from the cream. So it's good to use at work. Another important thing about this cream is the smell of it. I so love this perfume than when I'm in the UK I'm absolutely buying that Soap and Glory original pink fragrance. I need it in my life. When you apply this cream it feels like the whole world smells like rose and bergamot. The most astonishing hand cream ever? Definitely yes.